Heat oven to 425°. Cut veal into 6 even slices. Season veal with salt, pepper, and garlic powder. Combine celery, carrots, parsley, rosemary and 1/2 cup chopped onions. 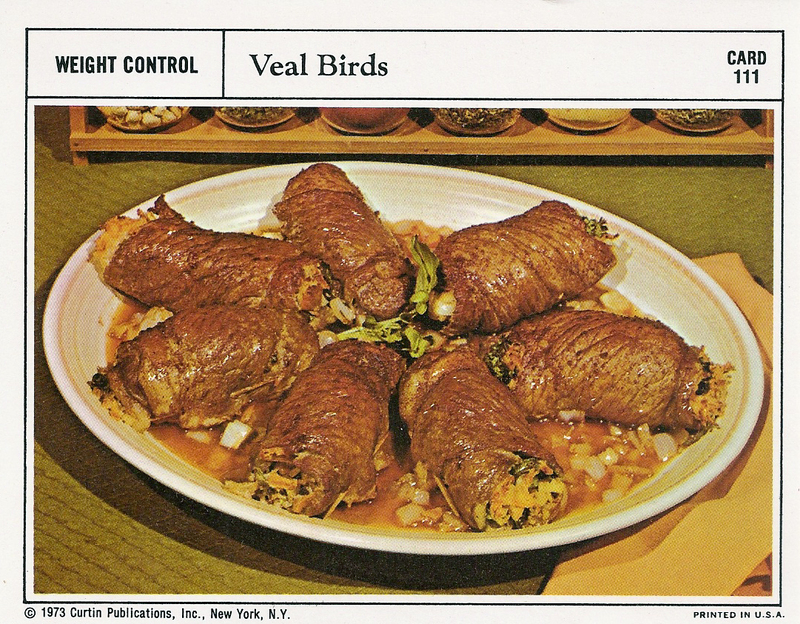 Spoon 1/6 of vegetable mixture onto each veal slice; roll and fasten with toothpicks. Season to taste with paprika, if desired. Place remaining 1/2 cup onions in pan with meat. Bake until golden brown – about 1/2 hour. Pour beef bouillon into pan, lower oven temperature to 350° and bake until done – about 45 minutes longer. For the life of me, I don’t understand how they came up with some of these names. Why are they called “birds?” Am I missing something? Dr. Julie, maybe it’s because they’re stuffed like little turkeys or chickens?